Arts Program | IBA Boston | Inquilinos Boricuas en Acción empowers and engages individuals and families to improve their lives through high-quality affordable housing, education, and arts programs. IBA’s Arts Program promotes and celebrates the diversity of Latino arts and culture through music, visual arts, dance and more. Housed at Villa Victoria Center for the Arts, the largest Latino arts center in New England, IBA presents concerts, festivals, exhibits and other high quality programming that is affordable accessible, and innovative. La Galería (current available space) is home to several incredible exhibits from national and international artists throughout the year, so your event could be surrounded by unique and one of a kind art. To see upcoming exhibitions you can visit our events page. Rent our space. Collect with a Click! Add to your art collection by purchasing pieces from current and past exhibitions on our online store. Never Miss an IBA Arts Event! "I learned a lot about my culture through Festival Betances and I feel lots of pride. I still come every year and now I’m bringing my children to participate. It’s great to see so many people of different cultures and economic backgrounds coming together to celebrate community through the arts." Latino Performance Series – Presents innovative Latino and Latin American music, dance and theater. La Galería – The first gallery in New England that presents year-round exhibits by artists from Latin America, the US and the Caribbean. Festival Betances – The oldest and largest Latino folk arts celebration in New England celebrated every year on the 3rdweekend of July. 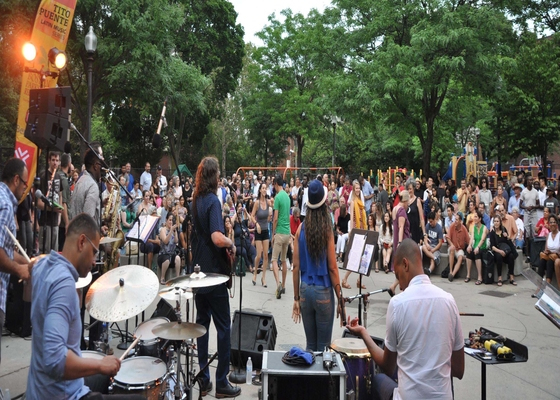 Tito Puente Latin Music Series – Summer concerts in Boston’s public parks in collaboration with Berklee College of Music and the City of Boston ParkARTS’ program. Special Events – Including multicultural celebrations of Hispanic Heritage Month, Three Kings Day, Black History Month and Chinese New Year, among others. Arts Education – Arts workshops and classes are integrated into IBA’s Preschool, Afterschool and Summer Learning, Youth Development and Resident Services Programs. Residents of Villa Victoria – an affordable housing community in Boston’s South End with a focus on elderly, disabled and primarily Spanish speaking residents. Latinos (18 to 65 years old) throughout the city and the region. Anyone in the New England community that appreciates Latino arts. School children from Boston elementary schools – whose school music programs have been decimated by budget cuts. Latino Artists of – local, regional, national and international relevance. For more information, please contact Elsa Mosquera-Sterenberg, Director at 617-927-1737 or emosquera@ibaboston.org.